Joey Lulu is 9 Months and Ruby is 2! 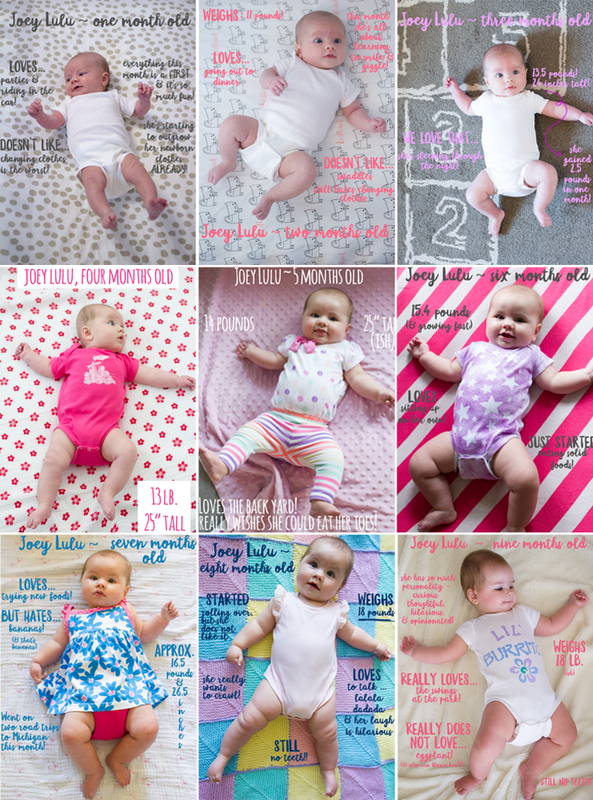 We’ve celebrated a lot of birthdays this week — Joey turned nine months old yesterday and Ruby turned two on Sunday! At nine months old Joanna is becoming a little girl with so much personality. 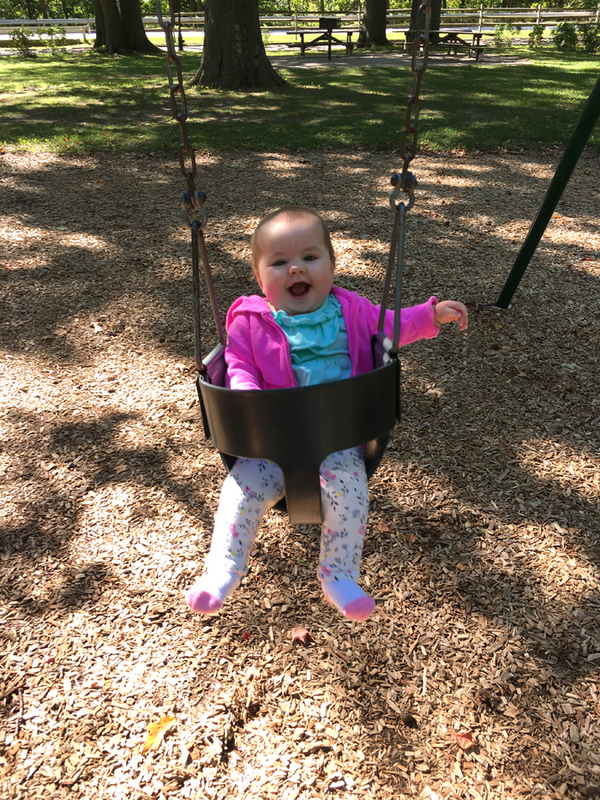 She’s curious about everything around her and squeals with delight when she is on the swings or sees one of her favorite stuffed animals. She’s observant and thoughtful and gets the cutest furrowed brow when she’s trying to figure something out. She’s fascinated by zippers and buttons and Andy’s work badge, and one of her favorite toys is a fake TV remote control. We’re definitely getting more and more glimpses of the little girl Joey will become. We’ve even had a couple of toddler moments recently, like yesterday when she started SCREAMING when I wouldn’t let her play with the computer charger. Oh no what are we in for??!! I’m worried Joey might take after me! We recently transitioned Joey to a new “big girl” feeding schedule with three meals a day. Before that she was eating 6 ounces of formula every three hours, at 7:30 a.m., 11 a.m., 2 p.m. and 5 p.m.. Now she has 8 ounces of formula at 7:30 a.m., 12 p.m. and 5 p.m., and has 1-2 ounces of solid food purees with lunch and dinner. I’m trying to get her used to finger foods, too, but so far she isn’t very interested in feeding herself. She does love to play with her food, though! She’s eating bananas now but really doesn’t like eggplant. She’s also mastered the art of the fake gag! The other day she “gagged” on her eggplant before it even went in her mouth, haha! (I feel the same way about eggplant!) She’s still taking a two-hour (more or less) nap in the morning and afternoon and going to bed around 6:15, so that’s amazing. She STILL doesn’t have any teeth! And she’s trying SO HARD to start crawling. She’s really close, but not quite there yet. I’m not in any hurry for it! We need to get the family room finished before we have a mobile baby and it’s not even slightly close. Ruby the dog also had a birthday this week! 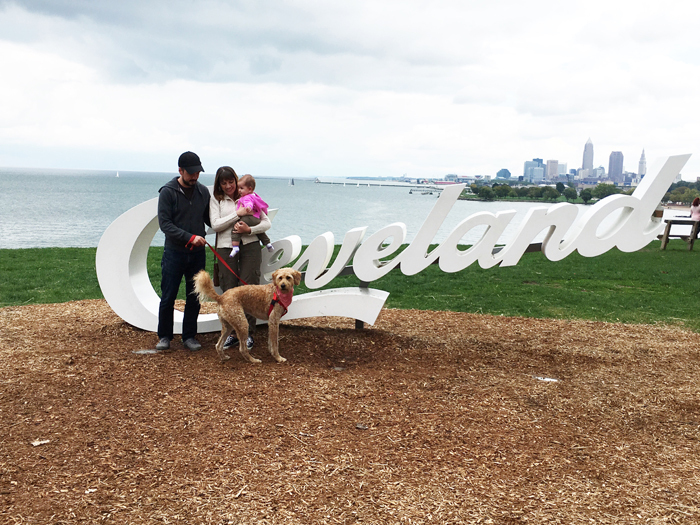 She turned two years old on Sunday and we celebrated by taking her to Edgewater Park to take her picture with the new Cleveland sign. She celebrated with some of the most BAD behavior we’ve seen from her in quite a while!! Super embarrassing. Strangers stopped in their car to try to help get her to sit for the family photo! OMG. And when I tried to take this photo of her and Andy, she was jumping up and down like a complete maniac. I have no idea how I managed to get one of her looking so calm! When Ruby was little we’d always say, “she’s a terrible puppy but she’ll be such a great two-year old…” Hm. 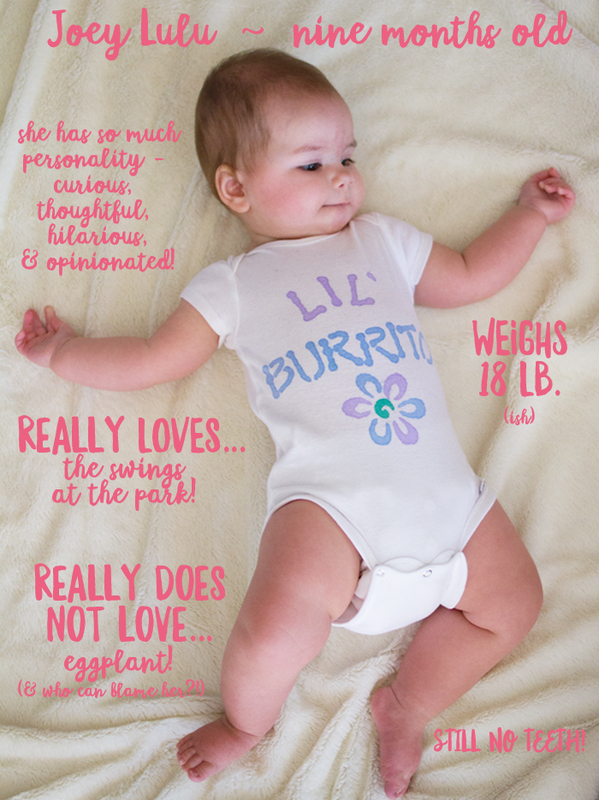 Maybe she’ll be such a great … four year old?? Ha. But seriously, Ruby is awesome. She’s a lot of fun, does great with Joey (perhaps only guilty of loving her too much and always wanting to lick her! ), and she naps A LOT. 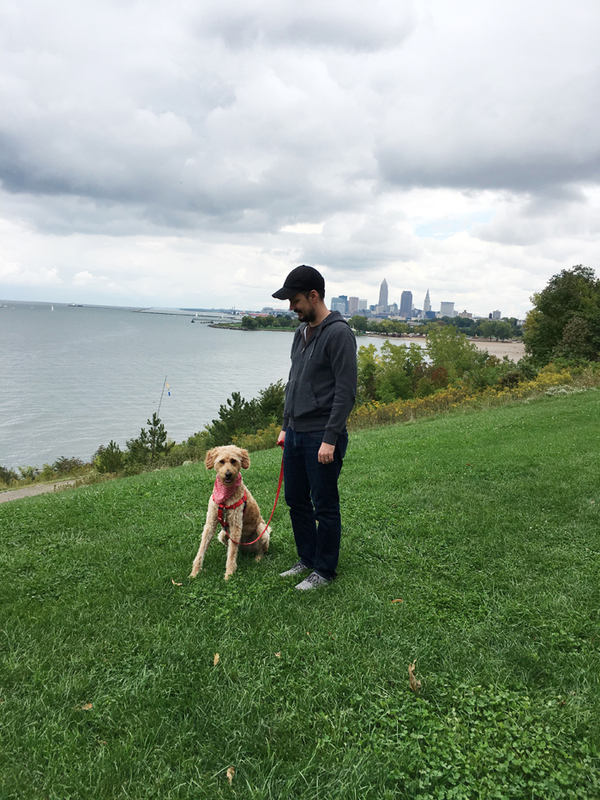 Besides her ridiculous meltdown at the park on Sunday, she’s usually really great and such a good dog, and we cannot imagine our lives without her! I tried to take a cute photo of Joey and Ruby together for their birthdays… and this is all I got!